Summer nights in Stockholm are rather to be enjoyed from the heights. 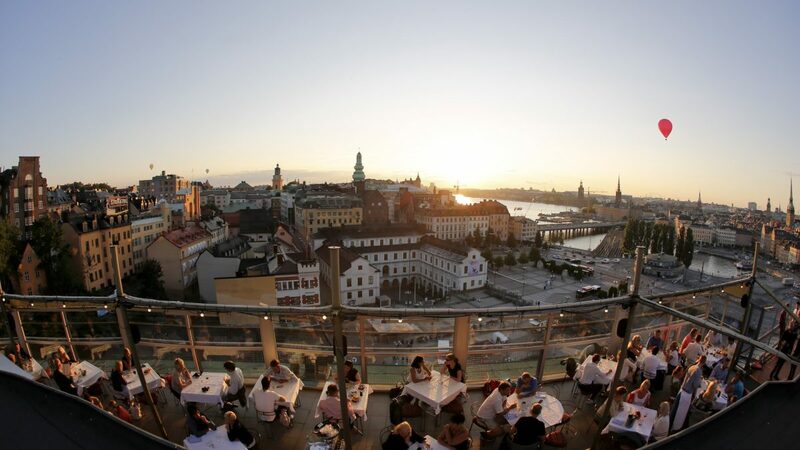 A never ending sunset with that magnificent light that Scandinavia has during summertime marks the beginning of the terrace or rooftop bar season. Cocktails, drinks, finger food accompanied by pretty people and the best music. These are my recommendations to enjoy the best views of the capital of Sweden while tasting your preferred cocktail. 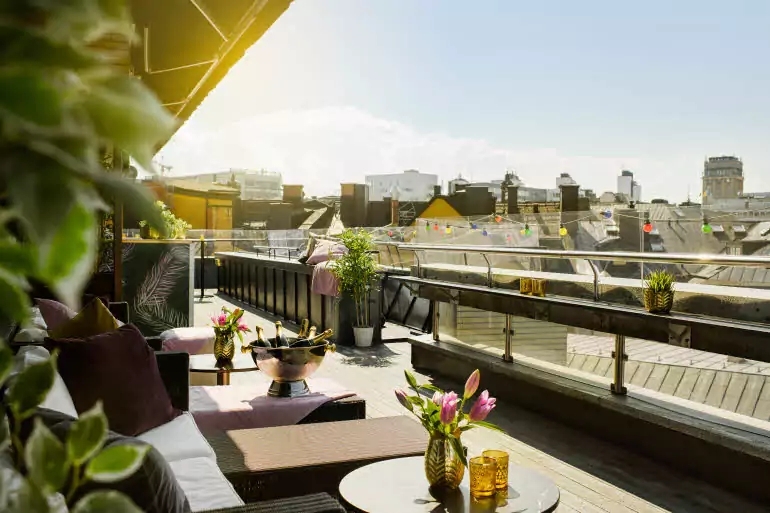 Located at Näckströmsgatan 8 beside Berzelii Park at Berns Hotel’s highest floor this small terrace features a great rooftop with views over Östermalm and the surrounding colorful roofs. Berns Cocktail Club opens in May and during the summer features international and Swedish DJ’s and bands from Wednesday to Sunday. Kulturhustaket is located at Sergels Torg 7 in the very heart of Stockholm and inside the house of culture Kulturhuset. Kulturhustaket is the biggest terrace in Stockholm and being there feels like being in a urban jungle. The breeze there is as cool as the iced tea with mint they serve at the bar. This is a place not just for drinks or dinners but to enjoy the many cultural events that fill their agenda during summer months. Specially don’t miss to pay a visit if you are visiting Stockholm in the middle of August when the city Cultur Festival has already started. Right in from of Slussen’s underground station is where Gondolen is located at Stadsgården 6. This is one of the favorite places for both Stockholmers and tourists. The bar at Gondolen is located at 33 m / 110 ft above sea level. It is famous because of its typical Swedish food and the creative interpretations of the cocktails served. Get yourself a drink and some tapas which may be for instance herring and shrimps with a dill dip. Great views over Gamla Stan, Södermalm and the Baltic Sea are a plus in this fantastic place. Mosebacketerrassen is also located next to Slussen underground station on the island of Södermalm at Mosebacke Torg 1-3. 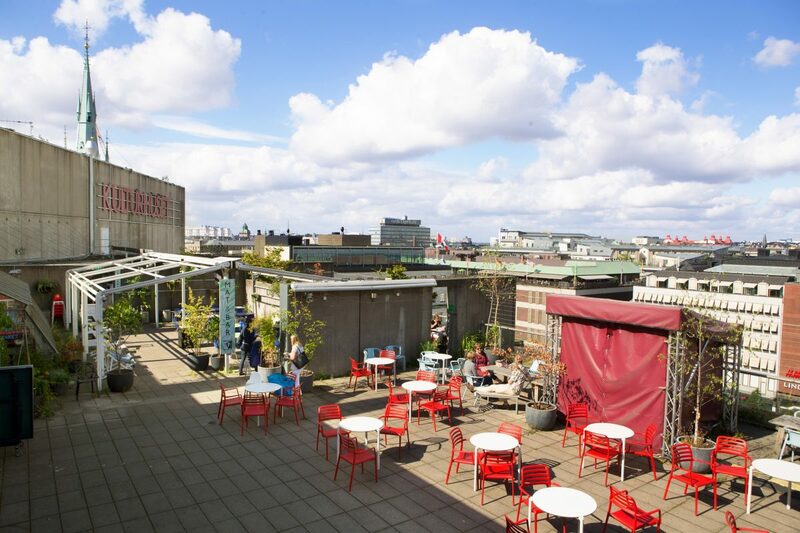 Mosebacketerrasen is the rooftop bar for the Southern Theater or Södra Teatern in Swedish. 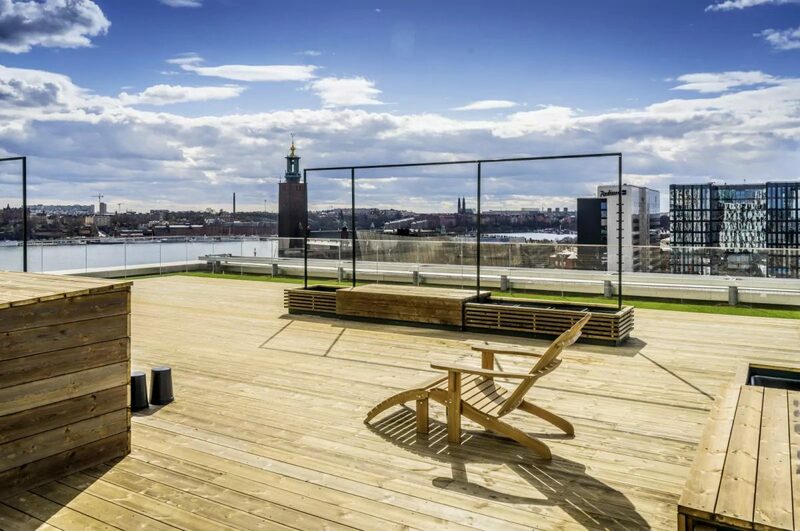 The astonishing views over Gamla Stan, Söder, Kungsholmen and Djurgården are a reason enough to pay a visit to this terrace. Great people and good cocktails are a plus. And if you are looking for a somewhat quieter place there are two smaller terraces (even higher up) called Södra Bar and Champagnebaren. The last one, Champagnebaren, is a beloved destination for Stockholmers who love bubbly drinks. 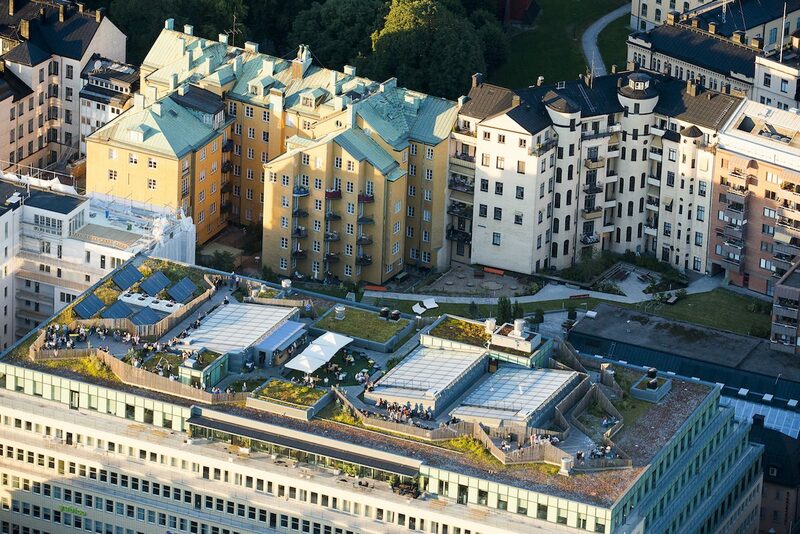 Terrassbaren at Humlegårdsgatan 23, is the hidden terrace located at the 7th floor of the Scandic Anglais hotel. Terrasbaren is a place to relax and have something to drink with friends after a day visiting the city. Cocktails and finger food is offered as well as a barbeque where they cook a house specialty: sausages. Terrassbaren at a walking distance from Stureplan which is one of the epicenters for night live in Stockholm and that makes it a perfect spot to start a night out. 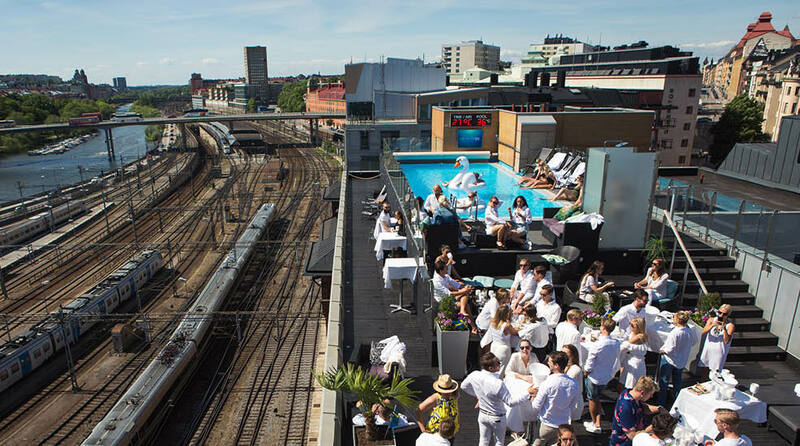 Selma Spa Bar is located at Östra Järnvägsgatan 35 (at the Clarion Hotel Sign terrace) and is the perfect place to have a drink and relax after enjoying the urban spa Selma SpaCity+. Besides cocktails, healthy (and yummy) Japanese inspired food is served to provide your body, mind and stomache with the perfect relaxation. A difference here is that Selma Spa is open all year long because the pool is warm all year round and the rooftop bar area can be covered when the weather is not so friendly. 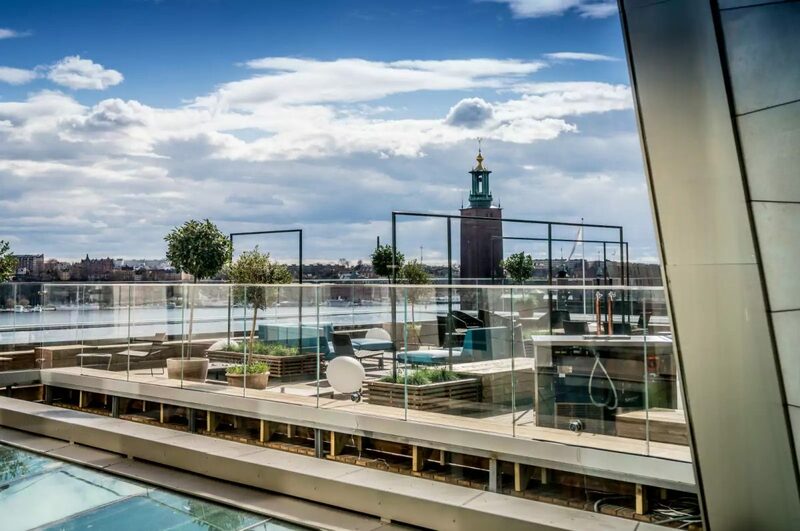 Capital is Scandic Continental Hotel (Vasagatan, 22) rooftop bar featuring amazing views over Riddarfjärden and Stockholm’s City Hall and located at the very heart of the city in front of the Central Station. Afterwork, cocktails, dinner … everything can be enjoyed in this newly opened spot. In the central Sveavägen street you will find a particular restaurant and delicatessen shop called Urban Deli (there is another popular one on the island of Södermalm next to Nytorget square). Urban Deli at Sveavägen 44 features Takparken a giant terrace that has become a park with views over the City neighborhood in Stockholm. During the winter Takparken transforms into a lovely decorated Christmas spot. 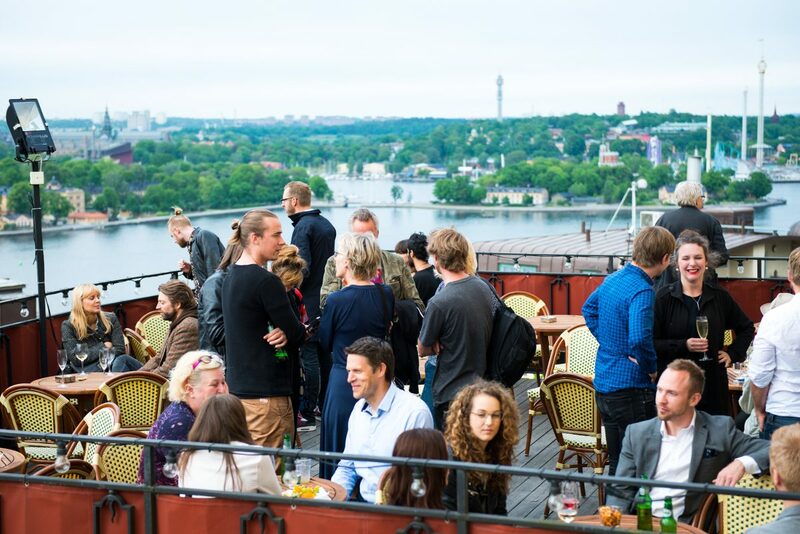 These are some of the many terraces popping up in Stockholm year after year where Stockholmers go to enjoy hot summer afternoons and enjoy having a drink with friends while listening to good music. 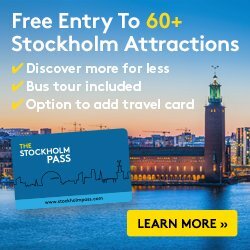 If you are traveling to Stockholm during the sunny part of the year don’t forget to add one of these to your bucket list and enjoy life during your trip the way Swedes do.